Separation processes demand clarity, efficiency and safety. CreaClear can be used as a precoat for polishing liquids and preventing the bleed-through of Diatomaceous Earth. Delicious and nutritious foods need to please a lot of critics. Children want flavor, moms need nutrition and manufacturers require quality ingredients for reliable results. CreaFill Fibers Corp. is the only US manufacturer processing both highly pure alpha cellulose grades and reclaimed mineral modified cellulose fibers. CreaFill Fibers simplifies the complexity of working with natural fibers providing customers with simple fiber solutions. Pure and consistent, CreaFill’s broad range of fiber ingredients provide natural, fiber based solutions. CreaFill utilizes cellulose, the most abundant, renewable resource on the planet, to achieve reliable and consistent results. All CreaFill Fiber products are offered in grades tailored to the process and the needs of the client. From fine powders to highly fibrillated flock, CreaFill’s unique processing technology opens up fiber strands increasing surface area, improving matrix formation and cohesion, adding function and value to your application. Quality drives CreaFill’s process to provide consistent and reliable ingredients. Functional fiber performance is the result of strict process control and critical laboratory analysis. CreaFill is certified by SAI Global ISO9001:2008. We operate facilities, including our ultra pure processing, which are BRC Certified as well as having both Kosher and Halal certifications. Additionally, CreaFill’s key operations in industrial fiber production adhere to strict Quality Management Standards (QMS) to provide significant advantages in consistency to the end user. Sustainability is at the core of CreaFill’s business. CreaFill products are GMO free, and we only source raw materials from producers using sustainable practices. CreaFill is continually improving performance in order to reduce energy consumption. Our industrial, reclaimed fiber grades contribute to LEEDScertification. The entire CreaFill facility works toward zero material wastethrough integrated recycling programs. Long term corporate plans include investing in sources of alternative energy to work in harmony with our environment. CreaFill is committed to sustainable business and a healthful environment because it is the responsibility we take for our environment and future. CreaFill brings the value of expert understanding of the nuances of customer requirements. We specialize in meeting unique quality needs for demanding processes. CreaFill routinely provides Certificates of Analysis with each order verifying product quality and consistency so that customers benefit from natural, pure ingredients. Developing international business is essential for future success. CreaFill provides its products worldwide through established relationships with reputable distributors. 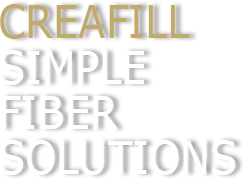 CreaFill gives global clients seamless service and the security of established protocols. We have years of experience in international transactions, and encourage business development with new markets. CreaFill Fibers is based in the USA within close proximity to several ocean ports allowing shipping options and competitive freight pricing. We encourage motivated distributors to contact us.